Reservoirs tanks are used to feed bulk fluids to a variety of dispensing valves. A range of sizes are available including bottom ported for medium to high viscosity liquids and top ported for low to medium viscosities. An “open top” style is used if liners are required to prevent the material from making contact with the sides of the container or if the fluid requires an agitator. 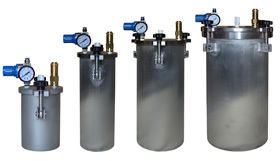 All reservoirs come standard with associated airline, fluid line, regulator, and fittings. Standard reservoir tanks are designed to maintain a steady fluid pressure for most dispensing applications, offering high chemical resistance and protecting against fluid contamination and evaporation. Stainless steel reservoir tanks are designed to maintain a steady fluid pressure for most dispensing applications, while providing excellent protection against corrosion or contamination. 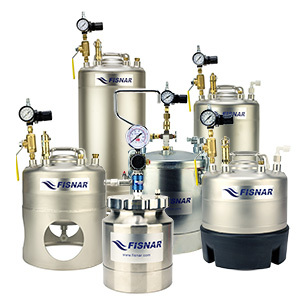 In addition to metal reservoir tanks, Fisnar offers the glass PP300 see-through chamber for dispensing low viscosity liquids directly from bottles and up to 1lb jars. 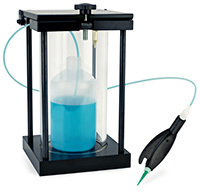 Regulated air pressure forces the liquid in the bottle up through a disposable tube to a connector, which can be interfaced to a valve or dispensing pen. This model is ideal for applications where it’s desirable to see the material without opening the chamber.